Limited Edition Platinum Colored Vinyl. Finally, the album that put crunk on the map retuns to vinyl. 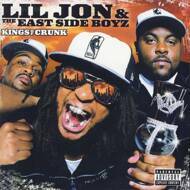 Kings of Crunk helped establlish Lil Jon & The East Side Boyz as larger than life stars in the rap music scene. King of Crunk's overabundance of club anthems helped garner heavy radio rotation all across the country, leading to its double platinum certification. In honor of the 15 year anniversary of the record, it will be pressed on one-of-a-kind platinum vinyl. Now casual and die-hard rap fans alike can enjoy this classic the way it was meant to be; in a unique blinged out format.